My Murshid, F. A. Ali ElSenossi, has requested that I summarise the work translated by Muhammad Alamgir, Muhammad in the Vedas and the Puranas(1). Rather than give a sequential account of this work, the material relating to the Vedas, the Puranas, and the Mahabharata have been grouped together. The reason for this approach is threefold, a) as an aid to the reader it allows the material to be grouped succinctly according to locality, rather than having them dispersed, as it is in the original work; b) an attempt will be made to present the material in a more Islamic manner as the original work seems to be directed towards those familiar with Hinduism, and c) to briefly introduce these works of Hindu antiquity to unfamiliar readers so that they may better appreciate the argument. Before proceeding with the analysis, it may be useful to include a few remarks on comparative philosophy in general, including the method employed here. Put simply, comparative philosophy is a method for highlighting the similarities and differences between texts or ideas. The potential for misunderstanding occurs when the texts being compared use different, or even seemingly contradictory, terminology. This problem is compounded when the works being analysed are written in different languages. To overcome this problem it is necessary to move beyond the form of a word or idea and examine the function it has in relation to the words or ideas that surround it. While there may be no correspondence between the forms, if their respective functions correspond then it can be said that these words or ideas are the same. This is exactly what Dr Upaddhayaya(2) and Prof Bandhopaddhayaya(3) have done, as will be seen, arguing that references within the ancient Hindu texts correspond to no other known figure than the Holy Prophet Muhammad (may the peace and blessings of Allah be upon him). While these comments regarding the method of comparative philosophy are overly simplistic, they are included to help clarify the method utilised within Muhammad in the Vedas and the Puranas. (1). 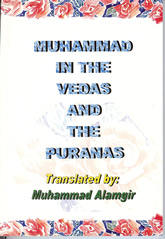 Muhammad Alamgir (trans) 1998, Muhammad in the Vedas and the Puranas, A. S. Noordeen, Kuala Lumpur. (2). Ved Prakash Upaddhayaya, 'Narashangsa and the Antim Rishi', 'Kalki Avatar and Muhammad', and 'Religious Unity in the Light of the Vedas', in Alamgir (trans) 1998, pp. 1 - 103. (3). Ashit Kumar Bandhopaddhayaya, 'Muhammad in the Vedas and the Mahabharata', in Alamgir (trans) 1998, pp. 105 - 157. The Vedas are a large body of texts from Ancient India. It is an umbrella term generally referring to the four canonical Vedas, the Rigveda, Yarjurveda, Samveda, and Atharvaveda. They form part of the sacred texts of Hinduism. According to the Hindu tradition the Vedas are apauruseya, 'not of human agency'. The Sanskrit word veda means 'knowledge, wisdom' and derives from the root vid, meaning 'to know'. The Vedas were traditionally transmitted orally and their memorisation included up to eleven forms of recitation. While to cover the content of the Vedas would take us too far afield, it is worth noting that their contents included hymns, incantations, and rituals(4) . Throughout many of the Vedic scriptures there are repeated references to, praises of, and qualities of Narashangsa. All eight mantras of the Rigveda, the oldest of the Vedas, start with the word 'Narashangsa', fourteen mantras of the Atharvaveda record praises of Narashangsa, with further references in both the Samveda and the Yajurveda(5) . Thus, references to Narashangsa can be found in all four canonical Vedas. Narashangsa is a combination of 'nar', meaning 'man', and 'ashangsa', meaning 'praised', such that Narashangsa, rather than meaning 'human praise' or 'praised by men', refers to a human known as 'The Praised'(6) . Thus, throughout the Vedas the virtues of 'The Praised Man' have been sung. In the Atharvaveda it is stated "Listen, O People of the world, Narashangsa will be praised here"(7) . From this two things become apparent. Firstly, The Praised Man did not come during the time of the Vedas. The evidence of this is from the fact that a) the Atharvaveda was the last of the Vedas to be revealed and b) it says "will be praised" and not "has been praised". Secondly, The Praised Man will be praised by the "People of the World" and not any particular community. From the Vedas the following qualities are ascribed to Narashangsa, The Praised Man. He will be called "Honey-tongued" for his sweetness in speech, is a kavi, a messenger known for his Divinely revealed knowledge, will be a sharchi, someone who is beautiful and radiant, he is Prati-Dhama-Nanjan, one who "brightens every home", and dissuades humanity from sins(8). These are The Praised Man's internal qualities. As for his external signs, the Vedas say that The Praised Man will ride camels, will have twelve wives, will be aided with one hundred gold pieces, will be honoured with ten garlands, will receive a gift of three hundred horses, and will receive a gift of ten thousand cows(9) . Before proceeding to analyse these qualities it is possible to see that it is unlikely that The Praised Man, to whom these qualities are attributed, is any other than the Holy Prophet Muhammad. However, some of these qualities are not instantaneously obvious and others need further elaboration to show the extent to which they correspond. From the above it is obvious that kavi is the Sanskrit equivalent of rasul, though kavi can also be translated as "one who composes poetry"(10) which could be an allusion to Muhammad being referred to as a poet (21: 5, 37: 36, 52: 30, & 69: 41). The hundred gold coins refers to people who, like gold, were valuable, pure, and of sterling character and during the time of the Prophet there was such a group who were known as Ahl as-Suffa, the people of the bench(11) . The ten garlands refers to a group of people who were so close to the Prophet they were like necklaces, that is, totally committed to him, these are known as the Ashra Mubashra, the ten blessed companions guaranteed paradise(12) . Horses, known for their strength, speed, and usefulness in battle are an indication of the qualities of the three hundred who fought alongside Muhammad at the battle of Badr(13) . Similarly cows, denoting "people who are simple and well-behaved", refers to the ten thousand companions who accompanied Muhammad during the conquest of Mecca, which was achieved without bloodshed or torture(14) . While critics could accuse Dr. Upaddhayaya of fitting these materials into the life of Muhammad, this accusation would only be valid if one or two of the qualities of Narashangsa coincided with Muhammad. That all of these qualities a) are the qualities of one individual and b) coincide with the life of Muhammad, shows that critics would be hard pressed to disprove Dr. Upaddhayaya's conclusion that the Narashangsa is none other than the Holy Prophet Muhammad. This is further emphasised by the fact that the term Narashangsa, The Praised Man, is the Sanskrit equivalent of Muhammad, The Praised One. (8). Upaddhayaya (1998: 7 - 9). (12). Upaddhayaya (1998: 16 - 17). Regarding battle, it is written in the Rigveda, and repeated in the Athravaveda, that "when twenty chieftains along with their sixty thousand and ninety-nine attendants came to fight the King, whose name was 'pleasing to the ears' and was 'left without a patron', O celebrated Indra! You defeated the enemy by hurling upon them chariot-wheels from the unseen" (15).. The qualities of the King referred to within this verse should make him easy to identify, though there is still some debate over his identity. A name "pleasing to the ears" could mean that he is highly praised or is praised whenever his name is mentioned, a quality possessed by Muhammad, being "left without a patron" could refer to being left an orphan or it could mean one who is without a guardian, both cases being consistent with Muhammad, also Muhammad was considered a king amongst men(16) . All this points to Muhammad being the King referred to within this verse, though, to put this beyond doubt, it is interesting to note that during his time, Muhammad was opposed by the chieftains of the twenty prominent tribes of Arabia whose collective population was about sixty thousand(17). . Again it must be stated that critics who disagree with Prof. Bandhopaddhayaya's view that the King referred to is Muhammad would be hard pressed to suggest another candidate who corresponds as closely. (15). Quoted from Bandhopaddhayaya (1998: 142). (16). Bandhopaddhayaya (1998: 142 - 43). Furthermore, in the Rigveda it says "O Indra and Agni! I have heard, you bestow many more riches, over and above Jamat and Salat"(18) . Commentators on the Vedas have said that Jamat means either "the prospective son-in-law, who while lacking in good qualities, offers good money to the father to win the daughter" or "one who brings up his child" and that Salat means either "younger brother of one's wife" or "toasted paddy on the winnowing fan"(19) . It is highly unlikely that these words mean either of these things, especially when considering a) their context within the Vedas and b) the abovementioned comments. Considering the references to Muhammad within the Vedas it is more likely, and less convoluted, that these are well known Arabic words with Salat meaning 'prayer' and Jamat meaning 'to pray in a group'. This is further evidence of Vedic references to Muhammad. (18). Quoted in Bandhopaddhayaya (1998: 145). The Puranas are a collection of post-Vedic texts. There are 17 or 18 canonical Puranas, which are generally divided into three groups of six according to the prominence given to Brahma, Vishnu, or Shiva. They typically contain narratives of the history of the Universe from creation to destruction, genealogies of kings, heroes, sages, and jinn, and descriptions of Hindu cosmology, philosophy, and geography. While the bulk of the Puranas are Hindu, there are Buddhist and Jain Puranas(20). According to Hindu doctrine, an Avatar appears when irreligion prevails, when those devoted to the truth are oppressed and persecuted, when destruction is out of control, provisions are wasted, tyranny increases, and jealousy, malice and anarchy are widespread(21) . It is said that the Kalki Avatar would appear when barbarism reigns, crops decline, rivers dry up, Idols are worshipped, and mutual enmity is the order of the day(22) . By themselves, these signs could refer to any number of times in the past, or even the present, and thus could be said to be of minor importance. However, their importance increases when seen in conjunction the personal characteristics of the Kalki Avatar. The personal qualities of the Kalki Avatar mentioned in the Puranas are as follows: he will ride a special horse; will carry a sword; will be described as "Saviour of the world"; will have the cooperation of "four brothers"; is the "destroyer of Kali"; has unparalleled grace; his body odour will be sweet smelling; will have a large community; will be "born in the city of Shambhal" in the house of the chief priest; his mother is Sumati and his father is Vishnu-Yash; and in the Bhagabat Purana it states that the Kalki Avatar is "the one whose grace is unparalleled, who moves around on an extremely swift horse, whose foreskin is removed, and who has the authority of a king, he will be the one to destroy innumerable warlords and bandits"(23) . Many of these qualities are straight forward, while a few require some elaboration. That the Kalki Avatar will ride a horse and carry a sword shows that his arrival predates our current time, and that of the past few centuries, where horses and swords have been outmoded. The reference to a special horse that is extremely swift seems an apt description of the Buraq. The "four brothers" are most likely a reference to the four Caliphs. Kali is indicative of "the Devil and his consorts"(24) . Shambhal is said to mean a) "a place where one gets peace and security", b) "that which attracts others" or "confers distinction", and c) "a place situated near water" (25), combined we see that Shambhal means "house of peace and security"(26) , combined with the fact that Muhammad was born in the house of the chief priest of the Kaaba, it is more than likely that this is a reference to Makka. Sumati means "gentile and thoughtful"(27) , making its Arabic equivalent Aamina, Muhammad's mother. Vishnu-Yash means "worshipper of Vishnu"(28) , its Arabic equivalent being Abdullah, Muhammad's father. It may be responded that certain traits are too generic to conclude that Muhammad is the Kalki Avatar mentioned in the Puranas, which is true. However, as the number of traits analysed increases the likelihood that the Kalki Avatar is someone other than Muhammad, to whom all traits correspond, diminishes. (23). Upaddhayaya (1998: 60 - 61). Another of the main texts of Hinduism is the Mahabharata. It is one of the two major Sanskrit epics of ancient India, the other being the Ramayana. It is also one of the longest epic poems in the world, comprising over 74 000 verses, about 1.8 million words. It is generally thought that the composition of the Mahabharata began in the late Vedic period, around 8 BC, and did not reach its final form until about 4 BC. The Mahabharata tells the legends of the Bharatas, a Vedic Aryan group, the Kurukshetra war, the fates of the Kauravas and Pandavas, also including philosophical and devotional material that discusses the four goals of life, being enumerated as dharma, right action, artha, purpose, kama, pleasure, and moksha, liberation. The Bhagavad Gita is one book of the Mahabharata(29) . This succinct description encapsulates so much about the life of Muhammad and those who follow him, mentioning his migration to Medina and the sorrow of leaving Mecca, the practice of following the Sunna, and the practice of visiting the Prophet in Medina. Following the arrival of the kalki "men of truth become active again" and "the House which the wicked had filled, with the clamour of their hand-made gods" will be cleansed . Even with this brief summary it is possible to acknowledge that these qualities refer to no known individual other than the final Messenger to Humanity, the Holy Prophet Muhammad. Dr Upaddhayaya writes that "the Puranas existed before Adam"(35) . Alamgir takes issue with this statement, querying "if Adam was the first man, and if the Puranas existed before him, then, in what manner were these scriptures handed over to Adam or to man" ? (36) Alamgir's response is that these scriptures "have been corrupted in various ways for various reasons"(37) in their transference. While this may be the case, from an Islamic perspective, there is another possibility. While Adam was the first human, the Jinn existed before him. This can be seen in the Qur'an (18: 50) where is says that Iblis, a Jinn, refused to prostrate to Adam, upon the latter's creation, proving the prior existence of Jinn to man(38) . However, it does not make sense to state that "before Adam, i.e. in the age of the Puranas, mankind was divided into four classes" (39). Before Adam, the first human, mankind did not exist. However, if 'Adam' is here used as a generic term for any of the prophets and messengers then we could accept this statement, though it does not give any indication to the age of the Puranas. (38).For more on this see The Treasure (Issue # 23 page 21). Allah would not make them render help to the Messenger coming after the prophets without giving them indications of his characteristics and qualities. The work translated by Alamgir shows the indications given to the Hindus so that they may believe in and render help to the final Prophet and Messenger to humanity, the Holy Prophet Muhammad. About the reviewer: Abu Bakr (Benjamin) Cook has a Master's Degree in Philosophy from the University of Tasmania. He is studying Tasawwuf under the guidance of his Murshid, F. A. Ali ElSenossi.